I was doing some shopping (read: surfing Amazon) for Black Friday and I was checking out all of the home automation gear. Things have come a long way! Home automation has been a passion of mine for many years - although to date I still haven't automated my lights! I will eventually prevail... I think that with the ESP-Live (my latest attempt) I will prevail. Nowadays the Google and Amazon speech recognition are getting really good. I think I will work on a project to interface the speech recognition into my home automation, one day. Back to the point. Why do I still not have a working home automation system, you ask? I have spent many years trying to develop my own custom system. I personally think that buying a system off the shelf is too easy... and no fun! There are also features that I want, that probably don't exist except in extremely high end systems (and I haven't necessarily decided on these features just yet!). I have gone through many iterations of design with different technologies, but one fact remains: the switches must be wireless so that they are easy to install and they must fit into the wall to replace my current switches. Perhaps some day I will write a post detailing all the light switched I have half designed... and why I stopped. Arduino has pretty much taken over the hobbyist world in my opinion. It's really easy to get something up and running in no time compared to the DIY approach with the raw microcontrollers, in circuit programmers, etc. Kind of like C++ versus C#, I guess. 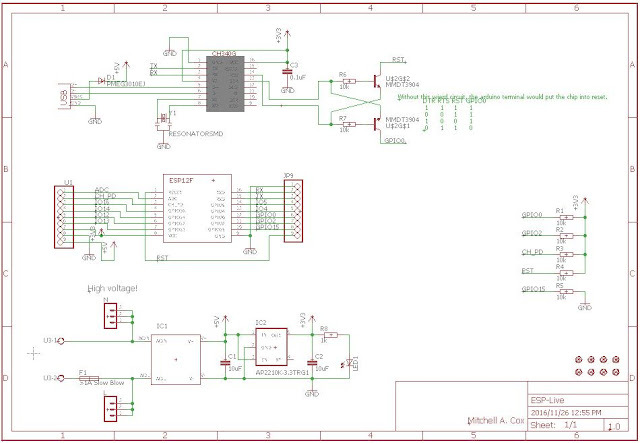 I usually prefer to not use something like Arduino, because it's too easy. In recent years, however, I have changed my mind. I think that since Ardunio is literally just a comprehensive C/C++ wrapper on top of existing Atmel gcc, it's not really cheating... I still want to design my own hardware - but at least now I can do that and not waste too much time on bringing it to life. I like the ESP modules because they have a lot of documentation and are powerful and really cheap! 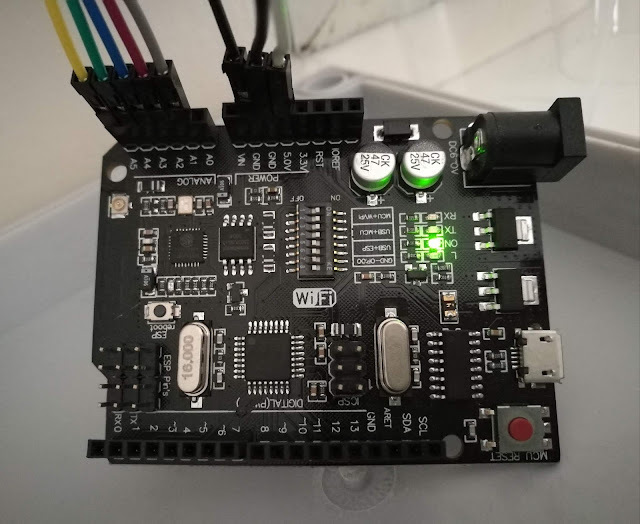 I like what NodeMCU has done in making the ESP8266 more like an Arduino, but I still want to do C programming and not script in Lua. The ESP-Live is an ESP-12F module, on a fairly general purpose board with all of the IO's broken out, with a USB-Mini port for programming and debugging, power supply, etc. The ESP-Live has an on board AC/DC converter so that you can connect it directly to the mains! The shields can then be things like TRAIC or MOSFET dimmers, power measurement boards, etc. I have also designed it to be as compact as possible. The final design measures a mere 30x65cm! Small enough to fit inside a 2x4 inch light switch box inside the wall. I'll post the design files on GitHub soon. 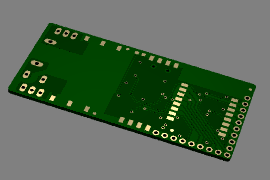 A 3D rendering of the top of the PCB. The areas for the ESP module is visible on the right. To the left is the area for the power supply module and AC input.